Limousines and banquets are no longer considered cool enough by private enterprises for wooing clients. Another way to impress has taken off – helicopter trips. With more businesses renting the aircraft to facilitate and entertain customers and associates, the helicopter charter business has spiraled up in China. Recently, Capital Helicopter Co, a major helicopter service provider in China in terms of fleet size, opened a new helipad by the Third Ring Road in Beijing to transport clients to and from the city center. The downtown area used to be a no-go zone for commercial helicopters for safety reasons, but the government has gradually been opening up low-altitude airspace in recent years, making helicopter charters possible in metropolitan areas. Capital Helicopter was a business department of Hainan Airlines, one of the largest carriers operating in China, until 2011, when it became a subsidiary company. The parent company, HNA Group, believed the sector had great potential and deserved more autonomy. 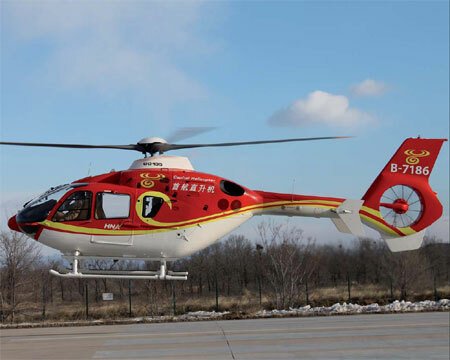 The helicopter company is the first to offer a charter service in Beijing, gaining permission from the government to provide other services including first aid and surveying. It operates 14 helicopters, and plans to increase the fleet to 21 by the end of this year, making it the largest helicopter company in China. The helicopters can land at any airport across the country, but the usual service range is 500 kilometers. "Rich people are tired of cars and golf. Flying is certainly much cooler," says Guan Xiwen, a helicopter instructor at the Guangzhou Suilian Helicopter Training Co in Guangdong province. Guan says a few private entrepreneurs buy and fly their own helicopters, but most choose to charter from helicopter companies, as owning one is extremely expensive. Simply taking a course of flying lessons costs 200,000 yuan ($32,100; 24,600 euros). Customers who require a helicopter can book the service a day ahead. The company must then go through procedures required by the Air Traffic Management Bureau before the aircraft is allowed to take off. The Chinese government has strict requirements on low-altitude flights, and Beijing is subject to the most stringent control due to its political significance. But as demand rises for helicopter travel, the government is gradually deregulating this area and allowing companies like Capital Helicopter to fly at shorter notice. The company has not issued revenue figures for 2012, but says it has turned a profit since it was established the previous year. Its registered capital was 450 million yuan. Xu Lidong, president of Capital Helicopter, says he hopes the revenue from the charter sector will account for 20 percent of total revenue in the near future. Currently, most revenue comes from power-line inspection, geophysical survey, high-end travel and mineral prospecting work. "Although the charter business is not our biggest cash generator, we expect it to be the major one very soon," Xu says. "In the US, there are about 250,000 planes (including helicopters) dedicated to the charter business, but in China the number is just a fraction of that, which doesn’t match our economic scale." As a compromise to local government, Capital Helicopter has pledged to take on some public service duties, mostly emergency first aid. A single aid flight costs about 30,000 yuan an hour, yet the government subsidy is only about 600 yuan an hour. The company is also talking with governments of Inner Mongolia, Suzhou, Ningbo and Shanghai to build heliports, which would cost from 30 million yuan to 50 million yuan, Xu says. He Chi, vice-president of Capital Helicopter, says he expects the charter business to grow by 20 percent annually, and that the revenue from this sector will soon cover spending on public service duties. Meanwhile, regular charter services to particular destinations are gaining in popularity. The company has just opened a route from Beijing to Wutai Mountain, a tourist destination famous for its Buddhist heritage. It takes 90 minutes to fly from downtown Beijing to the mountain, carrying a maximum of five people and the pilot. It costs 40,000 yuan an hour to charter a helicopter. For those wealthy enough to afford their own helicopters, the company offers escrow services by helping to maintain the aircraft, providing pilots where necessary, and handling government-required applications before takeoff. It now looks after four helicopters belonging to private businesses. The rise in helicopter transport has also brought business opportunities for Western companies. Eurocopter Group, the biggest helicopter manufacturer in Europe, established a China office in 2006 expecting the growth in the market. It is the only European helicopter company to open a subsidiary company for China. The others have only dealerships or agencies. Of the 246 helicopters for general aviation in China, 98 are Eurocopter products, including 14 EC135s, a luxury model which can fly 948 kilometers nonstop with a speed of 254 km/h. A EC135 costs between 2 million and 4 million euros. "The general aviation market is developing fast in China, and in recent years there has been greater demand for helicopters," says Norbert Ducrot, senior executive vice-president of Eurocopter Asia-Pacific. "I predict this trend will continue in the future." In 2011, Eurocopter only delivered five helicopters in China, but last year the number soared to 17.